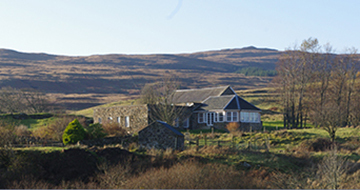 By car: From Glasgow follow the A82 along Loch Lomond, turn right in Tarbet, continuing on the A82 past Crianlarich until you have gone through Tyndrum where you fork left on to the A85 to Oban. Follow the one way system through Oban and you will see signs to the ferry terminal. If you would prefer an even more scenic route, carry on to the A83 in Tarbet around Loch Fyne towards Inveraray. There you turn right on to the A819 which takes you back on to the A85 at Loch Awe. Turn left and follow the A85 to Oban. From Oban you can get a Caledonian Macbrayne ferry to Craignure. It is advisable to book your ferry from Oban in advance, particularly in peak season. 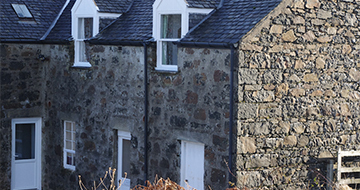 It is also possible to get smaller ferries from Lochaline to Fishnish and Kilchoan to Tobermory which may suit your plans better. These ferries are not pre-booked. We are 15 miles north of Craignure. From Craignure until Salen the road is single carriageway but after Salen it becomes single track with passing places. Ardnacross is 4½ miles past Salen on the A848. The farm is on the seaward side of the road, it is further on than most satnavs think. 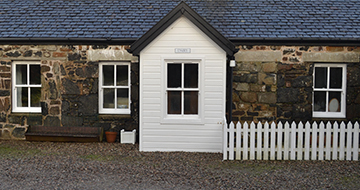 Ardnacross has two drives; the self-catering properties are reached through the northern most drive. There is a large sign at the end of the drive for our farm shop and an honesty box for our free range eggs. 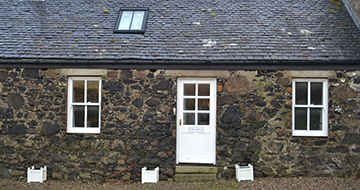 The Stables is 200 yards down the drive on the left and continue down the drive where you will arrive at the courtyard in which you will find the Square, Byre and Dairy cottages. If you are coming from Tobermory, we are 5 miles south of the town on the left hand side, just as you come down a hill and the road straightens out. By train or bus: Oban is well served by public transport either by train from Glasgow Queen Street or by bus from Glasgow. Both will bring you close to the ferry terminal. In Craignure there is a bus which meets the ferry and will take you to the end of our drive, simply ask them to drop you at Ardnacross.